Enjoy this incredible secret wedding playlist. Seriously, this playlist is what keeps our company at the top of its game. Take a peek & see if you can't find some ideas for your wedding. * Songs that sound great while driving down the road, may be a dance floor killer… songs that you thought were a “sure hit” may not have the energy and beat that you were hoping for to get people up and moving. * Your wedding guests will more than likely vary in age and musical tastes. For example, your aunt Sue LOVES to dance! But she only likes disco! Meanwhile you and your friends have your own style you love. *Obviously playing a cocktail hour playlist during the dance party would be a DISASTER. Most people don’t consider the different environments that require different songs. * BEST Ceremony Music Playlist. * BEST Cocktail Hour Playlist. * BEST Special Dance Songs. * BEST High Energy Dance Songs. * BEST Classic Dance Songs. 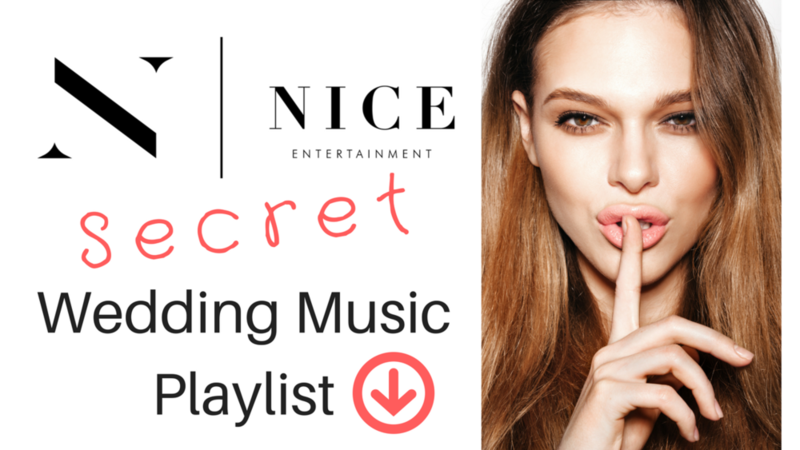 Grab this free download where we’ll pull back the curtain on the “secret” playlists top wedding DJ's are using to pack dance floors across the country.